Welcome to the Brent Subic Admissions Page! We designed this section to help you get the information you need about our school and our application procedures. We aim to give you personalized assistance in order to guide you thoroughly through the application process. The Admissions section of our site is designed to help you get to know the school, download applications, book a campus tour, make an online inquiry or contact us directly. The best place to start is with Connect. Have an enjoyable time learning about Brent Subic and we look forward to meeting you soon! Fill-up our Application Forms available here and send them via e-mail to crivero@brentsubic.edu.ph or jadelacruz@brentsubic.edu.ph. You may also opt to secure an Application Packet from our office on campus and submit it directly to Admissions personnel. Settle the Admissions and Testing Fee of $100.00 USD in advance or on the date of your scheduled test. Schedule dates of testing and interviews with our office. This part of the admission process will take two days. A parent or guardian must be present on the day of interviews. Upon acceptance, submit the Slot Reservation Deposit and completed Admission and Enrollment Agreements within five (5) working days to ensure a space in class. Completed Application & Health Forms. Download them here. Certified copy of academic records/report cards from the last two years of school prior to application. If the records are in a language other than English, an official English translation must be attached. Confidential Evaluation Forms. Download them here. Brent International School, Subic is primarily a college–preparatory institution. Only students who intend to seek admission to a college or university will be accepted. We operate on a rolling admission policy. This means there is no specific deadline to apply for admission throughout the school year. Students with exceptionalities will be admitted based upon the school’s ability to meet their educational needs. Applicants are admitted and retained on the basis of their ability to meet the academic, moral, and behavioral standards of the school. o English as a Second Language (ESL) is only available in grades 1-8. Applicants requiring ESL support in grades 9-12 will be subject to further evaluation. In accordance with its commitment to being a family school, special consideration is given to qualified siblings of currently enrolled students. Despite this consideration there is no guarantee of admission. Due to having a cut-off date later than most schools, the Admissions Committee is often conservative with Nursery, Pre-Kindergarten, and Kindergarten applicants having October, November, and December birthdays. Even if an applicant’s birthday is before Brent’s cut-off date, the grade level below might be recommended for the sake of developmental readiness. Acceptance decisions are made on a case-by-case basis, keeping in mind both the skills of the applicant and the students already enrolled in Brent. If an applicant seeks enrollment at Brent significantly after the start of our school year without having started the grade level applying for, a placement at Brent in the same grade level completed at their previous school can be expected. This situation occurs mostly with applicants from Australia due to our academic calendars being off by half of a year. Even if a high school student is quite capable academically, not being able to meet graduation requirements due to missing course credits prevents Brent from promoting a student to the next grade level. This will lengthen a student’s time in a particular grade level by a few weeks or months, and this extension often serves to aid in the student’s transition by allowing them needed time to adjust to the teachers, curriculum and new friends at Brent. Entrance tests and interviews are scheduled individually throughout the year by appointment only when the complete application packet has been submitted. The entrance tests are administered to all applicants of Kindergarten and above, including former Brent students returning after one or more years of absence from Brent. o The entrance tests are usually done in the morning, Monday through Friday. o Interviews are scheduled the following day. The Admissions Committee makes decisions in the best interest of the applicant, as well as in the interest of the specific grade level. The right is reserved to refuse admission to any applicant who does not meet the admissions requirements. The right is also reserved to determine the placement of an accepted applicant in the grade level or subjects deemed most appropriate for the student’s success. o An applicant is approved for admissions and the family pays the U.S. $500 non-refundable Slot Reservation Deposit. o The Admission Agreement from should be signed within three working days from the family’s receipt of the written notice of acceptance. o An applicant meets all admissions requirements and is approved for admission, but space is not available in the grade level or program. o The family may choose to pay a refundable U.S. $600 to be placed on the wait pool. o The applicant will be notified as soon as space becomes available. o Brent International School Subic offers no guarantee that a space will open. o The name of the applicant will remain on the wait pool (only for the academic year accepted for) until a space opens or the application is withdrawn. o An applicant is not approved for admission. o The Admissions Committee is not able to predict success for the applicant at Brent International School Subic, either academically or behaviorally. o REAPPLYING: A mandatory six-month waiting period is required before a second application. o The Admissions Office will keep the original application materials, and there is no need to pay the application fee if admission is sought within one year of the initial application. o New academic records, confidential evaluation forms, and entrance tests are usually required for the second application. After an applicant is notified of acceptance, an Enrollment and Admission Agreements are offered to the family.The contract contains specific information about financial obligations, admissions agreement, and procedures for re–enrollment and withdrawals. An Enrollment Slot Reservation deposit of $500.00 should be paid within the next 5 working days (7:30 a.m. – 3:00 p.m.). The signed Agreements are due with the deposit. This deposit ensures a slot for the applicant, otherwise the slot may be given to another applicant. This deposit is non–refundable but is credited towards the school fees upon enrollment. Before coming to the school to enroll, visit or call the Accounting office first for the exact assessment of school fees, telephone no. is +63 (47) 252 6833. Proceed to the Bookstore to purchase uniforms and get supplies. *All instructions for transitioning in BISS may be found in the New Family Information Guide given to the applicant upon acceptance. o Brent Subic applicants register for bus service at the Admin Office (optional). o Students are required to live with at least one parent while enrolled at Brent. This policy is enforced beginning on the date an applicant is scheduled for entrance tests and interviews. o Students whose parents live abroad may be admitted, provided there is a written affidavit of guardianship signed by the parent(s) and the guardian(s). It is understood that the designated guardian(s) will be responsible for the child and will act for and on behalf of the parents on matters pertaining to the child’s education at Brent. o Students who are of legal age (18 years, above) is encouraged guardianship. For further inquiries, please contact the Director of Admissions at +63 (47) 6871 or +63 (47) 252 6873. Every family has a unique story. Often times many ask familiar, similar and good questions about admission to Brent Subic. We have compiled the most commonly asked questions and our responses to help make your time with our website most effective and helpful to your consideration of our school. Our school year runs from August to May and includes at least 180 teaching days. Our holidays include Christmas, Easter and Philippine holidays. What grade levels are offered at Brent Subic? Brent Subic offers Nursery to Grade 12. What curriculum does BISS use? Like the other Brent schools in the Philippines, BISS follows a Western (English-based) curriculum accredited by the Western Accreditation of Schools and Colleges (WASC) and Council of International Schools (CIS) based in the United States and recognized by the Philippine Department of Education (DepEd). The IB (International Baccalaurette) Diploma Program is also offered in grades 11 and 12. Classes begin at 8:00 AM on Monday, Tuesday, Wednesday and Friday and 9:00 AM on Thursday. All classes end at 3:00 PM everyday. Students are required to join at least one after school club or activity which may run until 4:00 PM. The ideal number of students in ELC is 16; 18 in First Grade; 20 in Second Grade; and 24 in Third to Twelfth Grade. Can I apply even if my child’s first language is not English? We give equal opportunities to all applicants here at Brent. Every applicant will undergo an assessment and interview which will determine their acceptance and placement. For Upper School applicants, admission is possible if they place at an ESL level of 3 or higher. Can I proceed to the next step of the admissions process if i have incomplete documents? We may move forward to scheduling tests and interview dates only when all required forms and documents have been submitted to our office. Does Brent school help with student visas? 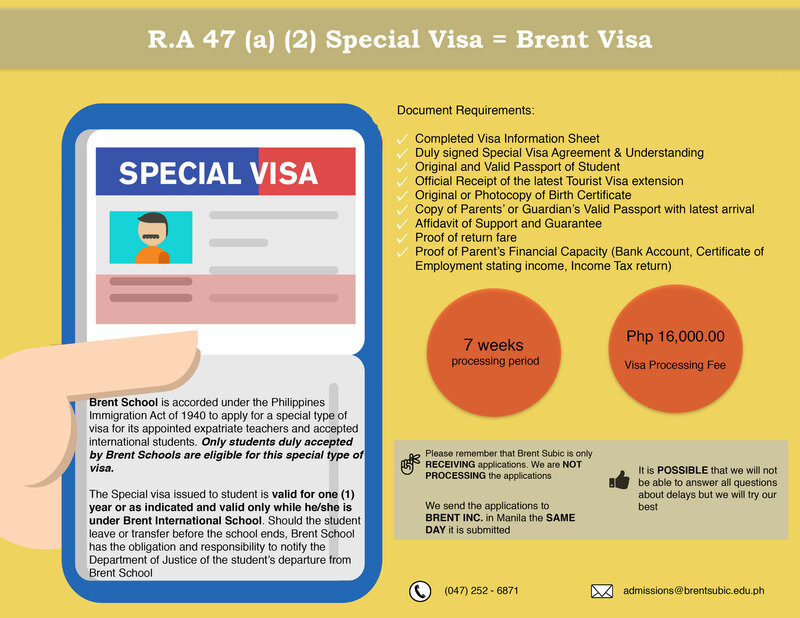 Brent Subic assists students in getting a Special Non-Immigrant Visa that serves as a valid tour and study permit and is good for one school year under Philippine Republic Act 47(a)(2). My home country does not issue birth certificates. What document can I submit instead? You may submit a Family Registry in the absence of a Birth Certificate. What are your policies on recommendation forms from previous schools? All recommendation forms must be accomplished by the appropriate people: a subject or homeroom teacher and the Principal or Guidance Counselor. These forms are confidential and must be submitted to our office sealed in an envelope or mailed directly to us by the appropriate people. All documents submitted that is not in an English language must be accompanied by official and notarized English translations. What if we are transferring from another Brent school? Students from all Brent Schools who intend to transfer undergo a process that is facilitated by both schools’ Admissions offices. Get in contact with your campus’ Admission Office and they will assist you throughout the transfer. When should I submit my application? Is there a deadline? Brent Subic operates on a rolling admissions and we accept applications all throughout the year. What grade should I apply to? Current/previous grade level, age, and the academic level determined through our entrance exams are all factors taken into account when arriving at a grade level placement decision. The family should consider their child’s current grade level and age in their application. When and how can I pay for the application fee? Our Accounting Office accepts cheques, wire transfers and cash payments. You may get in touch with our Cashier by calling +63 (047) 252 6833 or sending us an e-mail to arrange your payment. Otherwise, you can opt to settle the testing and application fee on the day of your scheduled tests. Can I apply while I am in another country? Our Admissions Office tries their best to accommodate online applications for families who find it difficult to be physically present for a portion or even the entirety of the admissions process. You may contact us through e-mail so we can settle the best course of action for your case. Applicants may sit scheduled entrance exams when all document requirements have been met and the application fee settled. Each application submitted to our office are reviewed before corresponding test and interview arrangements are made. Depending on the grade level, age, and academic background, tests can take at least an hour and as long as 3 hours. What tests are given for admission? A standardised test measuring academic performance is given to all applicants from Grades 2 through 12. The exam has 60 items and covers Maths, Language and Reading. Applicants who are not native english speakers are also required to take a set of supplemental english language skill assessments. Applicants will be interviewed by up to three people from the Admissions Committee throughout the scheduled interview day. Do I need to take an English test even if I am a native speaker? Native english speakers no longer need to take an english language skill test. English as a Second Language (ESL) is only available in grades 1-8. Applicants requiring ESL support in grades 9-12 will be subject to further evaluation. In accordance with its commitment to being a family school, special consideration is given to qualified siblings of currently enrolled students. Despite this consideration, there is no guarantee of admission. What possible decisions can we expect?